Medications that affect the renin–angiotensin–aldosterone system (RAAS) form the mainstay of current heart failure (HF) therapy in patients with reduced ejection fraction. Concerns about the risk of hyperkalaemia have created a significant barrier to optimal RAAS inhibitor therapy in patients with HF, however, and many patients are discontinuing or receiving suboptimal doses of these lifesaving therapies. This has serious health and economic implications due to adverse renal and cardiovascular events. There is therefore an important unmet need for novel therapeutic options for the long-term management of patients with, and at risk for, hyperkalaemia. Two new potassium-binding agents, patiromer and ZS-9, have been shown to be effective and safe for the treatment of hyperkalaemia, as well as the maintenance of normokalaemia, without dose reduction or discontinuation of RAAS inhibitors. In addition, the fast onset of ZS-9 action suggests that it may be useful in the treatment of acute hyperkalaemia. These agents may allow for dose optimisation of RAAS inhibitors for the long-term maintenance and protection of the renal and cardiovascular system. The renin–angiotensin–aldosterone system (RAAS) is an essential regulatory component of cardiovascular homeostasis that exerts its actions through hormones, angiotensin II and aldosterone, which regulate vascular tone and blood pressure by causing vasoconstriction and renal sodium and water retention.1 Abnormalities in cardiac function in heart failure (HF) activate the RAAS and sympathetic nervous system in order to maintain perfusion of vital organs.2 Prolonged activation of these systems causes myocardial hypertrophy, fibrosis and apoptosis, increased systemic vascular resistance, increased sodium and water retention, and potassium excretion. This has led to the therapeutic use of RAAS inhibitors in HF,3,4 including angiotensin-converting enzyme inhibitors (ACEIs),5 angiotensin receptor blockers (ARBs)6 and mineralocorticoid receptor antagonists (MRAs).7 These drugs have become the mainstay of current therapy in heart failure with reduced ejection fraction (HFrEF). While RAAS inhibitors have substantial clinical benefit in patients with HFrEF, they interfere with the stimulatory effect of angiotensin II on aldosterone secretion in the adrenal gland,8 resulting in decreased aldosterone concentrations, decreased delivery of sodium to the distal nephron, abnormal collecting tubule function and impaired renal excretion of potassium, leading to hyperkalaemia.9 This is particularly common in patients with hypovolemia and worsening of renal function. Furthermore, physiological changes associated with HF progression may influence the pharmacokinetics and pharmacodynamics of all drugs used in patients with HF.10 As a result of the risk of hyperkalaemia, many patients are maintained on suboptimal RAAS inhibitor therapy (both in terms of individual drug classes and daily dose) or even discontinuing therapy. Clinical data suggest that higher doses of RAAS inhibitors than those currently in use might be most effective11,12 but at present this cannot be tested because of the risk of inducing hyperkalaemia. This article aims to discuss the management of HF patients who require RAAS blockade but are at risk of worsening renal function and hyperkalaemia, as well as describing two new potassium binders that have the potential to allow more HF patients to receive optimal doses of guideline-recommended therapies. In a recent secondary analysis of the Prospective comparison of ARNI with ACEI to Determine Impact on Global Mortality and morbidity in Heart Failure (PARADIGM-HF) study, severe hyperkalaemia (potassium >6.0 mEq/l) was more common in patients randomly assigned to enalapril than to sacubitril/valsartan (3.1 versus 2.2 per 100 patientyears; hazard ratio: 1.37, 95 % CI [1.06–1.76]; p=0.02).32 These data suggest that neprilysin inhibition attenuates the risk of hyperkalaemia when MRAs are combined with other RAAS inhibitors in patients with HF. The exclusion from clinical trials of patients who are at the greatest risk for hyperkalaemia means that its true incidence may have been underestimated: in a study at an outpatient centre of 1,818 patients using ACEIs, 11 % of patients developed hyperkalaemia.33 In addition to this, patients in clinical trials are closely monitored, including frequent blood tests and clinical visits. As a result, rising serum potassium levels are more likely to be addressed at an early stage. Risk factors for hyperkalaemia in patients with HF include: age >65 years; comorbidities that impair kidney function and decrease eGFR, including diabetes (in which a prevalence of 15 % has been reported)34 and kidney disease (e.g. acute or chronic tubulointerstitial renal disease, diabetic nephropathy, renal transplants, urinary tract obstruction, systemic lupus erythematosus and sickle cell disease); current use of potassium-sparing diuretics, excessive potassium ingestion and the use of several concomitant medications including non-steroidal anti-inflammatory drugs (NSAIDs), antimicrobial drugs and beta-blockers.17,35–37 NSAIDs may also impair renal function in patients with HF.38 Since diabetes, CKD and HF occur together in many patients, hyperkalaemia presents a significant clinical challenge and an unfortunate paradox: while RAAS inhibitor therapy reduces morbidity and mortality in patients with HF, it increases the risk of hyperkalaemia in these already high-risk patients. The clinical consequences of hyperkalaemia are severe: arrhythmias and asystole that may lead to cardiac arrest and sudden death.39,40 Hyperkalaemia is responsible for increased morbidity, mortality and hospitalisations in patients with HF, particularly in older patients with comorbidities.27,36,41 Severe hyperkalaemia has a mortality rate of up to 30 % if not treated rapidly.42 Interestingly, one study found that the association between hyperkalaemia and mortality was no longer significant if the plasma potassium decreased by ≥1 mEq/l within 48 h of admission to the critical care unit.43 In addition to the direct risk imposed by increased serum potassium, intermittent hyperkalaemia has a more serious negative impact on clinical outcomes because its treatment usually involves discontinuation or dose reductions of lifesaving drugs.44 Although clinical data show that up-titrating RAAS inhibitors confers significant clinical benefit,11,12 the dosage of RAAS inhibitors is often suboptimal in everyday clinical practice,45,46 with one study reporting that less than one-third of eligible patients hospitalised for HF received guideline-recommended aldosterone antagonist therapy.47 Underutilisation of RAAS inhibitors results largely from clinician fears of adverse effects including hyperkalaemia.48 There is therefore a need for effective treatment options for hyperkalaemia. For >50 years, sodium polystyrene sulfonate (SPS), a cation-exchange resin that binds potassium in the colon, has been used in the longterm lowering of serum potassium levels.51 It is, however, intolerable to many, has never been tested in a randomised controlled trial and there are questions regarding its efficacy and safety.52 The administration of SPS alone can lead to severe constipation and impaction, which have led to its co-administration with sorbitol. Treatment with SPS and sorbitol, however, has been shown to cause potentially fatal colonic necrosis.52,53 SDS has a boxed warning for colonic necrosis and its use is contraindicated in patients who do not have normal bowel function.54 Despite concerns related to colonic necrosis, this serious complication appears to be rare: a retrospective cohort study found an incidence of 0.14 % in 2,194 patients prescribed SPS versus 0.07 % in those not prescribed SPS (p=0.2). Other strategies for the control of intermittent hyperkalaemia include the restriction of dietary potassium, but this leads to poor dietary adherence and limits healthy food choices that are associated with beneficial cardiovascular outcomes.55 Patients with HF are advised to restrict sodium intake, which leads to them using salt substitutes that are rich in potassium – a case was reported in The Lancet in 2013.56 For many years there remained an unmet need for a hyperkalaemia therapy that was effective, safe and well tolerated. In October 2015 the US Food and Drug administration approved the first new potassium binder for the treatment of hyperkalaemia in >50 years.57 Patiromer is an organic, high-capacity cation-exchange polymer in the form of its calcium salt complexed with sorbitol (ratio 2:1), and exchanges calcium for potassium as it moves through the colon, preventing the reabsorption of potassium and facilitating its elimination in the faeces (see Figure 1).58,59 It is a dry, odourless, tasteless powder that has a low viscosity, consisting of small (100 µm) uniform beads that swell minimally when suspended in water, and is typically administered in 40 ml of water with a meal.58 It does not require co-administration with a laxative and is more palatable than SPS. The US Food and Drug Administration issued a Complete Response Letter regarding the New Drug Application for ZS-9 in May 2016 due to observations arising from a pre-approval manufacturing inspection;68 however, resubmission is expected. A comparison of the available potassium-binding agents is given in Table 2. Of the three, ZS-9 and patiromer offer greater potassiumbinding selectivity than SDS and are unaffected by the presence of calcium or magnesium ions.13,58 ZS-9 has the fastest onset of action: within 1 h64 compared to within 12 h for SPS69 and within 7 h for patiromer.70 A combined analysis of both phase III trials of ZS-9 focused on the short-term changes in serum potassium of receiving an initial 10 g dose of ZS-9 in a subpopulation of patients with severe hyperkalaemia (defined as serum potassium 6.1–7.2 mEq/l). The mean serum potassium was reduced by 0.4 mEq/l at 1 h, 0.6 mEq/l at 2 h and 0.7 mEq/l at 4 h. The median time to serum potassium levels <6 and 5.5 mEq/l were 1.07 and 4 h, respectively. No cases of hypokalaemia or adverse effects were reported during the first 48 h of ZS-9 therapy.71 ZS-9 may therefore be useful in the acute setting. SDS when administered alone is associated with severe gastrointestinal side effects, making it unsuitable for routine use. Adverse effects with patiromer include mild-to-moderate constipation (up to 11 %), hypokalaemia (5–6 %) and hypomagnesemia (3–24 %), but these have not been reported to be serious. For ZS-9, mild constipation/ diarrhoea (2–8.7 %), hypokalaemia (around 10 % depending on dose) and oedema (2–4 %) have been reported. The latter was not serious in the clinical studies but, given the relationship between oedema and HF, patients should be monitored. The management of hyperkalaemia in patients taking RAAS inhibitors in HF is challenging, and often leads to suboptimal use of these lifesaving drugs, resulting in increased morbidity and mortality. Clinical trial data indicate that patiromer and ZS-9 are effective, safe and predictable options for the treatment of hyperkalaemia, as well as the maintenance of normokalaemia, without the dose reduction or discontinuation of RAAS inhibitors. In addition, ZS-9 offers the potential for acute therapy in conscious patients instead of insulin and glucose. Acute dialysis for the sole indication of hyperkalaemia may also be eliminated. It must be stressed that patiromer has been shown to demonstrate safety and efficacy over 52 weeks, but long-term safety data for ZS-9 are still not available; studies are currently ongoing. Further long-term, randomised-controlled trials will be needed to determine whether patiromer and ZS-9 can increase the use of optimum doses of RAAS inhibitors and improve outcomes in patients with HF. Future studies should include specific patient cohorts, including patients with severe hyperkalaemia, more advanced HF, those with a preserved ejection fraction and with severe CKD. Since hyperkalaemia is often diagnosed in the hospital setting, hospitalised patients should also be observed in future trials. Hyperkalaemia can develop during transient worsening of renal function, a relatively common occurrence during RAAS initiation/up-titration, and this warrants further investigation. There is a need for studies to determine whether there are any issues such as fluid and electrolyte or acid–base changes, drug–drug interactions or longterm tolerability that might influence the choice of patiromer or ZS-9 in specific patient populations or indications. There is also a need for more information on the long-term efficacy and safety of both drugs in real-world settings in patients with other comorbidities and taking multiple drugs. To date, ZS-9 and patiromer have only been evaluated in the treatment of hyperkalaemia, but they may find a more important role in the prevention of hyperkalaemia. At present, many patients with moderate CKD who have high serum potassium levels, around 4.8 or 4.9 mEq/l, are not given RAAS inhibitors because of the fear of causing hyperkalaemia. These agents may be beneficial in patients who have previously taken RAAS inhibitors but discontinued them after experiencing a single hyperkaliaemic event. They may also enable the use of RAAS inhibitors in patients with risk factors for hyperkalaemia. There is a need for further study investigating the optimisation of RAAS inhibitors in such patients. The fast onset of ZS-9 suggests that it may be an effective treatment option for acute hyperkalaemia. Again, further investigation is required. However, caution should be exercised in prescribing potassium binders; they should be given only to selected patients. In conclusion, the use of patiromer and ZS-9 represents an important development in HF therapy, potentially enabling patients with HF to optimise the use and dose of RAAS inhibitors, improve dietary choices, improve quality of life and possibly reduce morbidity and mortality in these high-risk populations. von Lueder TG, Sangaralingham SJ, Wang BH, et al. Reninangiotensin blockade combined with natriuretic peptide system augmentation: novel therapeutic concepts to combat heart failure. Circ Heart Fail 2013;6:594–605. Schrier RW, Abdallah JG, Weinberger HH, et al. Therapy of heart failure.Kidney Int 2000;57:1418–25. Brewster UC, Setaro JF, Perazella MA. The renin-angiotensinaldosterone system: cardiorenal effects and implications for renal and cardiovascular disease states. Am J Med Sci 2003;326:15–24. Effect of enalapril on survival in patients with reduced left ventricular ejection fractions and congestive heart failure. The SOLVD Investigators. N Engl J Med 1991;325:293–302. Shier DN, Kusano E, Stoner GD, et al. Production of renin, angiotensin II, and aldosterone by adrenal explant cultures: response to potassium and converting enzyme inhibition. Endocrinology 1989;125:486–91. Ramirez E, Rossignoli T, Campos AJ, et al. Drug-induced life-threatening potassium disturbances detected by a pharmacovigilance program from laboratory signals. 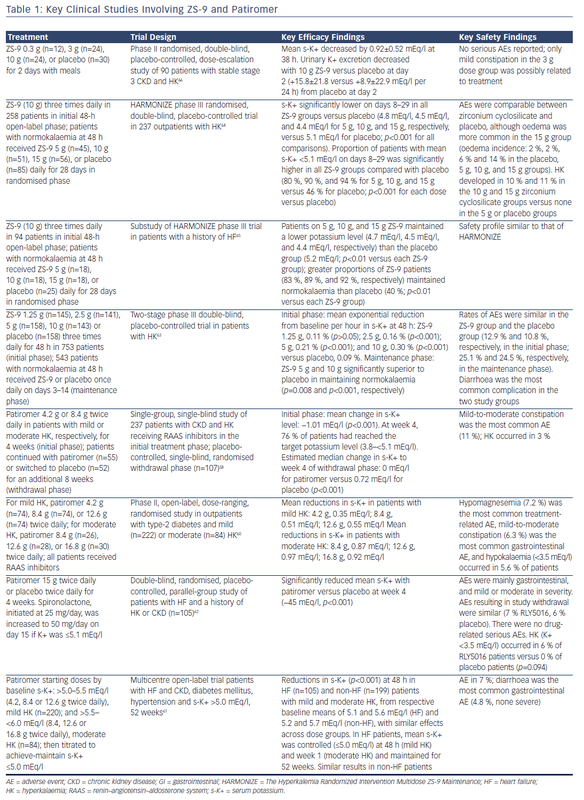 Eur J Clin Pharmacol 2013;69:97–110. Lainscak M, Vitale C, Seferovic P, et al. Pharmacokinetics and pharmacodynamics of cardiovascular drugs in chronic heart failure. Int J Cardiol 2016;224:191–8. Konstam MA, Neaton JD, Dickstein K, et al. HEAAL Investigators. Effects of high-dose versus low-dose losartan on clinical outcomes in patients with heart failure (HEAAL study): a randomised, double-blind trial. Lancet 2009;374:1840– 8. Stavros F, Yang A, Leon A, et al. Characterization of structure and function of ZS-9, a K+ selective ion trap. PLoS One 2014;9:e114686. Ponikowski P, Voors AA, Anker SD, et al. 2016 ESC Guidelines for the diagnosis and treatment of acute and chronic heart failure – Web Addenda. Eur Heart J 2016:1–17. Allen LA, Shetterly SM, Peterson PN, et al. Guideline concordance of testing for hyperkalemia and kidney dysfunction during initiation of mineralocorticoid receptor antagonist therapy in patients with heart failure. Circ Heart Fail 2014;7:43–50. Zannad F, McMurray JJ, Krum H, et al. Eplerenone in patients with systolic heart failure and mild symptoms. N Engl J Med 2011;364:11–21. Palmer BF. Managing hyperkalemia caused by inhibitors of the renin-angiotensin-aldosterone system. N Engl J Med 2004;351:585–92. Weir MR, Rolfe M. Potassium homeostasis and renin– angiotensin–aldosterone system inhibitors. Clin J Am Soc Nephrol 2010;5:531–48. Raebel MA. Hyperkalemia associated with use of angiotensinconverting enzyme inhibitors and angiotensin receptor blockers. Cardiovasc Ther 2012;30:e156–66. Kovesdy CP. Management of hyperkalaemia in chronic kidney disease. Nat Rev Nephrol 2014;10:653–62. Einhorn LM, Zhan M, Hsu VD, et al. The frequency of hyperkalemia and its significance in chronic kidney disease. Arch Intern Med 2009;169:1156–62. Muzzarelli S, Maeder MT, Toggweiler S, et al. TIME-CHF Investigators. Frequency and predictors of hyperkalemia in patients ≥60 years of age with heart failure undergoing intense medical therapy. Am J Cardiol, 2012;109:693–8. van Deursen VM, Urso R, Laroche C, et al. Co-morbidities in patients with heart failure: an analysis of the European Heart Failure Pilot Survey. Eur J Heart Fail 2014;16:103–11. Grigorian Shamagian L, Varela Roman A, Pedreira Perez M, et al. [Renal failure is an independent predictor of mortality in hospitalized heart failure patients and is associated with a worse cardiovascular risk profile]. Rev Esp Cardiol 2006;59: 99–108. Maggioni AP, Dahlstrom U, Filippatos G, et al. Heart Failure Association of the European Society of Cardiology. EURObservational Research Programme: regional differences and 1-year follow-up results of the Heart Failure Pilot Survey (ESC-HF Pilot). Eur J Heart Fail 2013;15:808–17. Lainscak M, Cleland JG, Lenzen MJ, et al. International variations in the treatment and co-morbidity of left ventricular systolic dysfunction: data from the EuroHeart Failure Survey. Eur J Heart Fail 2007;9:292–9. Effectiveness of spironolactone added to an angiotensinconverting enzyme inhibitor and a loop diuretic for severe chronic congestive heart failure (the Randomized Aldactone Evaluation Study [RALES]). Am J Cardiol 1996;78:902–7. Eschalier R, McMurray JJ, Swedberg K, et al. EMPHASIS-HF Investigators. Safety and efficacy of eplerenone in patients at high risk for hyperkalemia and/or worsening renal function: analyses of the EMPHASIS-HF study subgroups (Eplerenone in Mild Patients Hospitalization And SurvIval Study in Heart Failure). J Am Coll Cardiol 2013;62:1585–93. Rossignol P, Dobre D, McMurray JJ, et al. Incidence, determinants, and prognostic significance of hyperkalemia and worsening renal function in patients with heart failure receiving the mineralocorticoid receptor antagonist eplerenone or placebo in addition to optimal medical therapy: results from the Eplerenone in Mild Patients Hospitalization and Survival Study in Heart Failure (EMPHASIS-HF). Circ Heart Fail 2014;7:51–8. Lainscak M, Pelliccia F, Rosano G, et al. Safety profile of mineralocorticoid receptor antagonists: Spironolactone and eplerenone. Int J Cardiol 2015;200:25–9. Desai AS. Hyperkalemia in patients with heart failure: incidence, prevalence, and management. Curr Heart Fail Rep 2009;6:272–80. Reardon LC, Macpherson DS. Hyperkalemia in outpatients using angiotensin-converting enzyme inhibitors. How much should we worry? Arch Intern Med 1998;158:26–32. Johnson ES, Weinstein JR, Thorp ML, et al. Predicting the risk of hyperkalemia in patients with chronic kidney disease starting lisinopril. Pharmacoepidemiol Drug Saf 2010;19:266–72. Jain N, Kotla S, Little BB, et al. Predictors of hyperkalemia and death in patients with cardiac and renal disease. Am J Cardiol 2012;109:1510–3. Michel A, Martin-Perez M, Ruigomez A, et al. Risk factors for hyperkalaemia in a cohort of patients with newly diagnosed heart failure: a nested case-control study in UK general practice. Eur J Heart Fail 2015;17:205–13. Bleumink GS, Feenstra J, Sturkenboom MC, et al. Nonsteroidal anti-inflammatory drugs and heart failure. Drugs 2003;63: 525–34. Alfonzo AV, Isles C, Geddes C, et al. Potassium disorders-clinical spectrum and emergency management. Resuscitation 2006;70:10–25. Genovesi S, Valsecchi MG, Rossi E, et al. Sudden death and associated factors in a historical cohort of chronic haemodialysis patients. Nephrol Dial Transplant 2009;24:2529–36. Korgaonkar S, Tilea A, Gillespie BW, et al. Serum potassium and outcomes in CKD: insights from the RRI-CKD cohort study. Clin J Am Soc Nephrol 2010;5:762–9. An JN, Lee JP, Jeon HJ, et al. Severe hyperkalemia requiring hospitalization: predictors of mortality. Crit Care 2012;16:R225. McMahon GM, Mendu ML, Gibbons FK, et al. Association between hyperkalemia at critical care initiation and mortality. Intensive Care Med 2012;38:1834–42. Houghton AR, Cowley AJ. Why are angiotensin converting enzyme inhibitors underutilised in the treatment of heart failure by general practitioners? Int J Cardiol 1997;59:7–10. Bungard TJ, McAlister FA, Johnson JA, et al. Underutilisation of ACE inhibitors in patients with congestive heart failure. Drugs 2001;61:2021–33. Albert NM, Yancy CW, Liang L, et al. Use of aldosterone antagonists in heart failure. JAMA 2009;302:1658–65. Hickling JA, Nazareth I, Rogers S. The barriers to effective management of heart failure in general practice. Br J Gen Pract 2001;51:615–8. Kessler C, Ng J, Valdez K, et al. 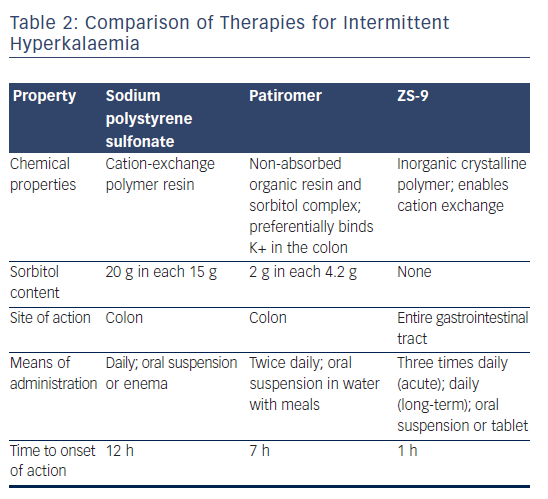 The use of sodium polystyrene sulfonate in the inpatient management of hyperkalemia. J Hosp Med 2011;6:136–40. Sterns RH, Rojas M, Bernstein P, et al. Ion-exchange resins for the treatment of hyperkalemia: are they safe and effective? J Am Soc Nephrol 2010;21:733–5. Harel Z, Harel S, Shah PS, et al. Gastrointestinal adverse events with sodium polystyrene sulfonate (Kayexalate) use: a systematic review. Am J Med 2013;126:264 e9–24. Hoye A, Clark A. Latrogenic hyperkalaemia. Lancet 2003;361:2124. Weir MR, Bakris GL, Bushinsky DA, et al. OPAL-HK Investigators. Patiromer in patients with kidney disease and hyperkalemia receiving RAAS inhibitors. N Engl J Med 2015;372:211–21. van der Meer P, van Veldhuisen DJ. To bind or not to bind: potassium-lowering drugs in heart failure. Eur Heart J 2011;32:791–2. Bakris GL, Pitt B, Weir MR, et al. AMETHYST-DN Investigators. Effect of Patiromer on Serum Potassium Level in Patients With Hyperkalemia and Diabetic Kidney Disease: The AMETHYST-DN Randomized Clinical Trial. JAMA 2015;314: 151–61. Pitt B, Bushinsky D, Garza D, et al. 1-year safety and efficacy of patiromer for hyperkalemia in heart failure patients with chronic kidney disease on renin-angiotensin-aldosterone system inhibitors. J Am Coll Cardiol 2015;65:S0735–1097. Pitt B, Anker SD, Bushinsky DA, et al. PEARL-HF Investigations. Evaluation of the efficacy and safety of RLY5016, a polymeric potassium binder, in a double-blind, placebo-controlled study in patients with chronic heart failure (the PEARL-HF) trial. Eur Heart J 2011;32:820–8. Packham DK, Rasmussen HS, Lavin PT, et al. Sodium zirconium cyclosilicate in hyperkalemia. N Engl J Med 2015;372:222–31. Kosiborod M, Rasmussen HS, Lavin P, et al. Effect of sodium zirconium cyclosilicate on potassium lowering for 28 days among outpatients with hyperkalemia: the HARMONIZE randomized clinical trial. JAMA 2014;312:2223–33. Anker SD, Kosiborod M, Zannad F, et al. Maintenance of serum potassium with sodium zirconium cyclosilicate (ZS-9) in heart failure patients: results from a phase 3 randomized, double-blind, placebo-controlled trial. Eur J Heart Fail 2015;17:1050–6. Ash SR, Singh B, Lavin PT, et al. A phase 2 study on the treatment of hyperkalemia in patients with chronic kidney disease suggests that the selective potassium trap, ZS-9, is safe and efficient. Kidney Int 2015;88:404–11. Bushinsky DA, Williams GH, Pitt B, et al. 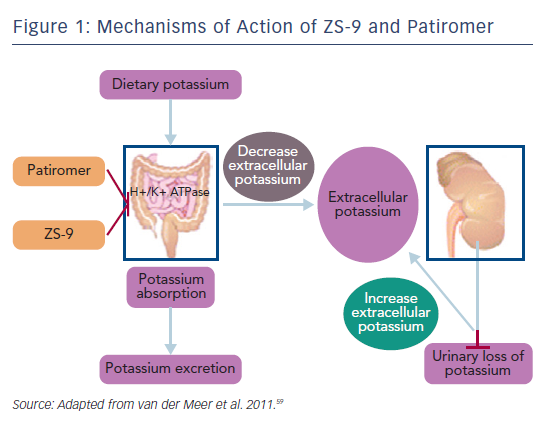 Patiromer induces rapid and sustained potassium lowering in patients with chronic kidney disease and hyperkalemia. Kidney Int 2015;88:1427–33. Kosiborod M, Peacock WF, Packham DK. Sodium zirconium cyclosilicate for urgent therapy of severe hyperkalemia. N Engl J Med 2015;372:1577–8.